For decades, the kitchen has been considered a special gathering place for families and their guests to enjoy good food and great company. Nowadays, kitchens are more than just a room where people cook and eat—they are an extension of their living area, thanks in large part to modern home designs. If you have an open concept kitchen, it can expand your home and encourage a more social, fun environment. However, with a wide-open kitchen visible for all to see, it’s important to make sure it has the right ambiance. One major aspect of kitchen décor that makes a huge difference in atmosphere are the kitchen cabinet paint colours. Mixing and matching colours can create a high energy feel or evoke a feeling of warmth in the space. Before you choose your final cabinet colours, here are some tips from the experts. If you want to create a bold or playful atmosphere in your kitchen, choose a daring colour like red, green, or blue, and pair it with a neutral colour. This allows you to use different colours without making it look overpowering. We also encourage you to always consult with a professional design/colour expert when choosing bold colours. Solid colours add character and energy to a space. For a warm look, work with colours like red, yellow, and apricot. These colours are comforting and also stimulate the appetite! They also stay stylish for years to come and will always impress your guests when they visit. You can also go for cool colours like blue or green. Some of the dreamiest kitchen paint colours include navy blue, white, bamboo leaf green, red, glossy black, ocean blue, and brown. If you find neutral colours boring and unmotivating, why not compromise by using two shades of one colour. For example, you can use dark shades of gray or tan on your upper cabinets and use a lighter shade of the same colour on your lower cabinets. This keeps things neutral but adds a unique and special visual style. Budget: How much are you willing/able to spend on your cabinet repainting? Design style: Do you want a traditional style with neutral colours or a bright modern palette? Size: Is your kitchen big or small? The colour of your cabinets can either oppress or expand the look of your kitchen. Lighting: How well-lit is your kitchen? Choosing dark colours in a kitchen with low light is not a good idea. Be sure to consider how much natural and artificial light your kitchen gets before choosing your final cabinet colour(s). Selling: Knowing how long you intend to live in your home is an important consideration before choosing your cabinet colours. As beautiful as vibrant and unique colours look, more homebuyers will prefer neutral colours. Mood: What mood or feeling do you want to create in your kitchen space? Do you want the space to evoke energy and youth, or elegance and refinement? What kind of paint do you use to paint kitchen cabinets? At Booth7, we use only water-based, low or zero VOC lacquer and solvents that are very consumer, pet, and household-friendly. Can I use satin paint on kitchen cabinets? Yes! A satin finish has a nice soft, uniform look, but does not appear flat. A higher gloss finish tends to show any imperfections and looks somewhat dated. Satin or low gloss paint makes a great choice for kitchen cabinets. Depending on the number of cabinets, doors, drawers, trim and other components you need to paint, kitchen repainting can cost between $200 and $3,000 for materials and $500 to $3,000 for labour. It actually costs about two-thirds of the cost of refacing (replacing the cabinet doors). Professionals will be equipped with all the tools needed to make your cabinets looks incredible, including specialty spraying equipment, high-quality primer, water-based lacquer, sanding equipment, etc. Can you paint over laminated kitchen cabinets? With proper pre-painting preparation and good quality primer, you can. The primer is designed to adhere to the laminate and create a surface that your paint will stick to. It will also help protect your paint from scratching or peeling off, cover old wood stain, and eliminate the musty smell of old cabinetry. Why Consult Professional Cabinet Painters? 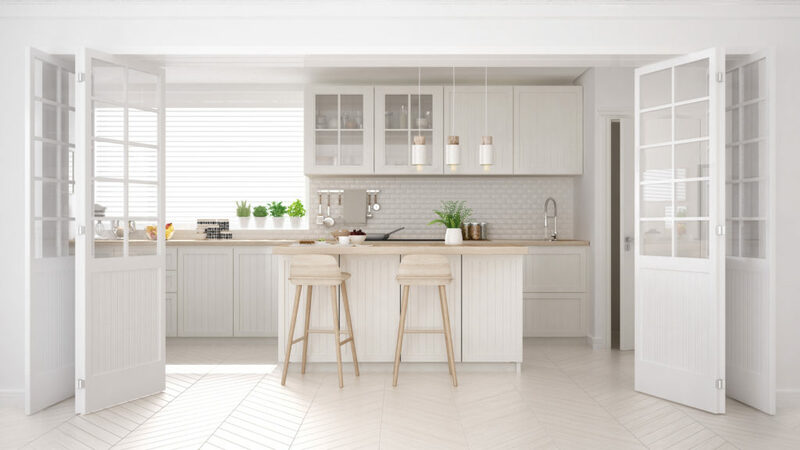 If you’re considering repainting your kitchen cabinets to give them a fresh look, working with a professional company is the best way to proceed. At Booth7, our furniture refinishers have the right training, experience, and materials to refinish your pieces in the most efficient and safe way possible to preserve or enhance their appearance. They are equipped with special tools and equipment that can save time and achieve the exact look you want. We also have a state-of-the-art facility and a professional closed paint booth that is properly ventilated and equipped with everything necessary to complete your project. Have small children and/or pets and you are worried about lingering paint smell and breathing in hazardous paint fumes? Don’t be with Booth7, you won’t have that problem. In fact, we’ve never had a single complaint about lingering paint smell during or after a refinishing project. For high-quality cabinet painting and refinishing, contact Booth7. Give us a call today and we should return your call immediately. but always within a few hours. We are available seven days a week to answer all your inquiries. We service Toronto and the surrounding areas. If you require our assistance or want a free consultation and estimate, please fill out our online form or contact us at info@booth7.com.